Rapini has a unique flavour that is a favourite in Italian and Chinese cooking. It is gaining popularity with chefs all over the globe and it’s easy to prepare. The blossoms, leaves and stalks of the rapini are all edible, and feature identical taste levels. Rapini is similar to, but much bitterer than Chinese broccoli. Rapini has many spiked leaves that surround a green bud which looks very similar to a small head of broccoli. The flavour of rapini has been described as nutty, bitter, pungent, and ‘an acquired taste’. Italians are very fond of rapini. Rapini is a source of minerals such as potassium which helps to normalize blood pressure, calcium which is beneficial for strong bones and iron which produces healthy blood cells and energy for the body to use. It also delivers vitamins A, C and K which are important to healthy bones. Select rapini with small, firm stalks, and dark green leaves. 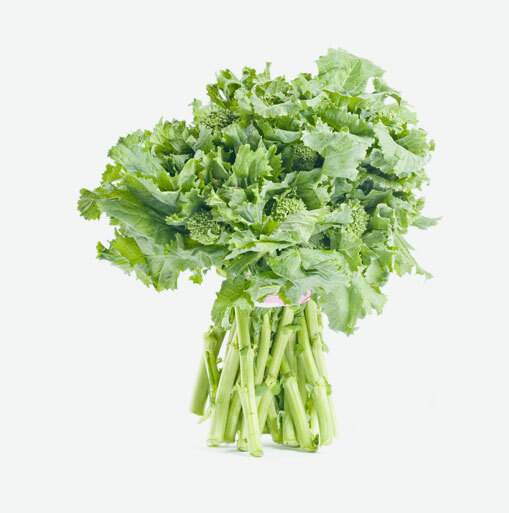 Avoid rapini that has most of its buds open, and has wilted, spotted or yellowish leaves. Wash rapin just before using as this will help rapini last longer. Place the vegetables in a perforated plastic bag, and they will keep up to 4 days in the refrigerator vegetable crisper. Rapini can be frozen after it’s blanched in boiling water for 2 minutes, then drained and cooled. It will keep for up to 3 months in a sealed container. Wash the stalks under cold water, drain, then cut off the ends. Rapini is now ready for use, whole or cut up into pieces. Every bit and piece of rapini is edible — the stalks, leaves and buds — it’s all delicious! Rinse rapin in a colander under cold water. Trim base of stems and discard. Cut the rest of the stems, leaves and tops crosswise into 2-inch lengths. Most cooks like to blanch rapini before cooking to reduce its bitterness. Plan on 3 to 4 servings from each bunch as a side dish, or two servings per bunch, if you plan to use it as part of a main dish. Some people like to separate the stalks from the leaves, as the leaves require a shorter cooking time. Cooking in water lessens the pungent flavour of rapini and takes away a lot of its bitterness. Allow about 5 to 8 minutes cooking time in water or steam. Rapini is ready when it’s tender, but still slightly crunchy. Rapini is delicious sautéed in a pan. If you are using rapini for simmered dishes, add rapini about 30 minutes before the end of the cooking time. In Italy, rapini is often served as a side vegetable or added to pasta dishes or risottos. In China, it’s added to stir-fried dishes. Cooked and cooled, it’s scrumptious in salads. It’s tasty in omelettes, quiches, soufflés and stuffings. On pizza or in soup, it makes for a delicious change. A simple dish to prepare with rapini is to sautée steamed rapini in olive oil with garlic and chili. You can also stir-fry the rapini in a wok with mushrooms and onion. To prepare rapini in the classic Italian fashion, braise the rapini in extra-virgin olive oil and season with garlic, anchovies, and breadcrumbs. Add this delicious vegetable to white beans and some angel hair pasta for a savoury dish. Rapini also goes well with other foods with big tastes and seasonings such as garlic, sausages, portobello mushrooms.